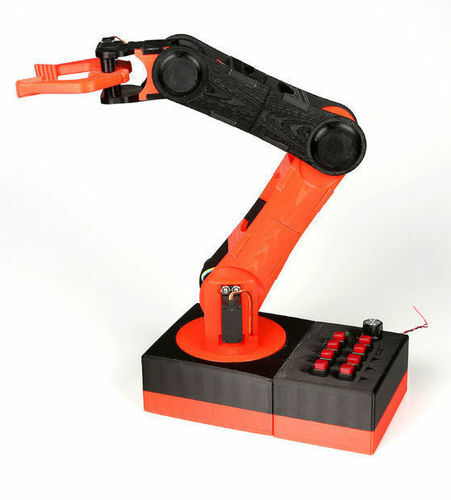 This robot arm is made almost entirely of 3D printed parts that snap together. 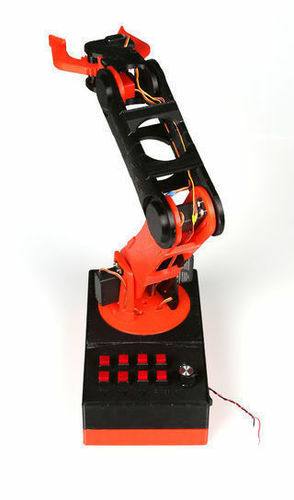 It has three servo-controlled joints, plus a rotating base and gripper. 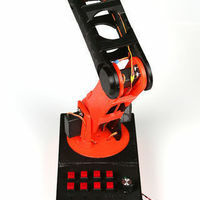 The arm is controlled by a series of buttons that connect to an Arduino Uno hidden in the base. 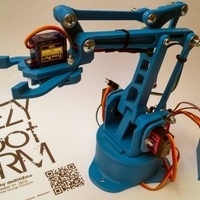 A simple circuit makes connecting the servos and buttons to the Arduino easy and makes set-up and assembly very quick. The arm is about 20 inches long, so it takes a lot of time and material to print. The parts are sized to fit on the bed of the Afinia H479 printer, and some can be printed together on the same platform to save time. I used a resolution of 0.25mm and hollow fill for all the parts (other settings were set to the defaults). 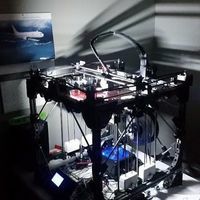 In addition, I found that I needed to use a raft to both help the part adhere to the print platform and help the printer compensate for my table, which was not perfectly level. The total estimated print time for the arm is about 32.5 hours, although as mentioned earlier some parts can be printed together (the estimate was done using the print preview function of Afinia's software - my actual print time was difficult to calculate because I was still iterating through designs). Including the raft material, it uses 842.8g of filament, which means it can be printed from one 1kg roll.